The Gaudiya Vaishnava school, unlike many traditions, does not have a single scripture it focuses on. Its literal corpus consists of some essential scriptures from the older tradition of Vedic literature, supplemented by a vast body of literature compiled by various students and followers of Sri Caitanya, among whom the six Gosvamis of Vrindavan were foremost. Presenting an exhaustive list of Gaudiya literature here would be next to impossible in this space. So being, we have included only works of choice that have been adopted in most lineages within the Gaudiya tradition, or that are otherwise unique. For a more exhaustive list, please refer to gkWiki. "Classical Literature" refers to writings predating Sri Caitanya, and the rest are writings compiled by the associates and followers of Sri Caitanya. Bhagavata-purana, also known as Srimad Bhagavatam, is a foundational text from the old Vedic corpus of literature for Gaudiya Vaishnavas. In its twelve Cantos, the Bhagavata narrates histories about the prominent avataras (descents) of God and about the lives of His devotees, along with the essence of the philosophy of the bhakti-tradition. A chapter in the voluminous Mahabharata-epic, Bhagavad-gita is perhaps the most widely known among all Vedic scriptures, studied by scholars and seekers of both the East and the West. In a discourse between Krishna and Arjuna, this book presents a synopsis of Vedanta philosophy and the precepts of bhakti over its eighteen chapters. A scripture discovered by Sri Caitanya during his pilgrimage to South India. It is said to be the fifth chapter of the original hymns of Brahma in one hundred chapters, recited at the dawn of creation in praise of the Lord. The Brahma-samhita is considered essential among Vedic literatures, since it contains the gist of all Vaishnava conclusions. Jayadeva's Gita-govinda is a widely known and respected poem presenting the amorous pastimes of Radha and Krishna in the springtime. Along with the writings of Candidas and Vidyapati, Gita-govinda was among Sri Caitanya's favorites. This composition of the saint Bilvamangala was also among the favorite writings of Sri Caitanya, and has been commented on by Gopala Bhatta Gosvami, Krishna Das Kaviraja and Caitanya Das. Some editions of this work include three sets of hundred verses, but only the first one is known to be Bilvamangala's with certainty. This title by Sanatana Gosvami consists of two parts. The first part narrates the adventure of Narada, and the second part narrates the adventure of Gopa Kumara. The reader is introduced with various philosophical conclusions in the course of the narration. The author has also written a commentary on the title. The first among the biographical works on Sri Caitanya, this work of Vrindavana Das Thakur is an in-depth description of the earlier life of Sri Caitanya. Focusing on the later life of Sri Caitanya, this is the second among the two major biographical works about Sri Caitanya. It is also an important part of the Gaudiya theological corpus of literature, written with an aim to bring about unity in the early tradition's theology. This work of Kavi Karnapura's describes the other-worldly identities of the prominent associates and followers of Sri Caitanya, who are presented as Krishna's companions who have descended from the world of Vrindavana. Gopala-campu is a famous poetic composition of Jiva Gosvami, its two campus (purva and uttara) describing in detail the various pastimes of Krishna. Campu is a composition in which the same subject is narrated through alternations in prose and verse. Compiled by Krishnadas Kaviraja on the basis of Rupa Gosvami's instructions, Govinda-lilamrita is one of the main works focusing on the asta-kaliya-lila, or the daily pastimes of Radha and Krishna over the eight phases of the day, frequently read and meditated on by the mystics of the Gaudiya tradition. This poetic drama of Ramananda Raya, describing the amorous pastimes of Radha and Krishna, was among the favorites of Sri Caitanya. The author was a close associate of his. This is the third and last among the major works exposing the daily pastimes of Radha and Krishna, compiled by Visvanatha Cakravarti. It is often subtitled "Maha-kavya", or "a great work of poetry", on account of its playful, skilled use of Sanskrit language. This work of Kavi Karnapura's is perhaps the first elaborate title describing the daily pastimes of Radha and Krishna. It is somewhat different in content from the other two works mentioned earlier. Lalita-madhava was originally intended to be one drama along with Vidagdha-madhava. However, Queen Satyabhama, a consort of Krishna's in the city of Dvaraka, appeared to the author, Rupa Gosvami, in a dream, and instructed him to divide his work into two separate dramas, one (Lalita-madhava) describing the pastimes of Dvaraka, and the other (Vidagdha-madhava) those of Vrindavana. Padyavali is an anthology of poetry compiled by Rupa Gosvami from various sources. Prarthana is a collection of songs composed by Narottama Das Thakura. Its contents are generally divided in three categories, namely prayers of dedication and submission, prayers of lamentation, and prayers of spiritual aspiration. Radha-rasa-sudhanidhi of Prabodhananda Sarasvati consists of 272 verses in praise of Sri Radha, longing for Her service. Stava-mala is a compilation of Rupa Gosvami's writings. It includes several famous titles such as Gitavali, Upadesamrita and Utkalika-vallari, which are often separately published. 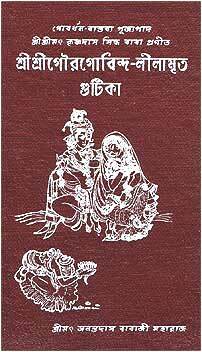 Stavavali is a compilation of Raghunatha Das Gosvami's writings. It includes several famous titles such as Manah-siksa and Vilapa-kusumanjali, which are often separately published. This is a drama compiled by Rupa Gosvami, describing the pastimes of Krishna in Vrindavana. See "Lalita-madhava" for more information. Vilapa-kusumanjali of Raghunatha Das Gosvami, 104 verses of praise, longing and lamentation, is perhaps the most excellent example of absorption in the zenith of spiritual life in Vraja in the entire Gaudiya canon. A vast poetic composition by Prabodhananda Sarasvati, consisting of 16 couplets of 100 verses in praise of Vrindavana. Bhakti-rasamrita-sindhu of Rupa Gosvami is one of the foundational works in the Gaudiya school. In its four sections, it elaborately describes the nature, practices and gradations of bhakti, the constituents of bhakti-rasa (experience of sacred rapture), and the primary and secondary divisions of bhakti-rasa. Govinda-bhasya is the Gaudiya commentary on the Vedanta-sutra, an ancient, concice compilation of philosophical sayings, which is understood to be the essence of Vedanta philosophy. Baladeva Vidyabhusana compiled his commentary under the inspiration of Lord Govinda Himself, hence the name "Govinda-bhasya". This work of Rupa Gosvami summarizes what is said at great lenght by Sanatana in his Brihad-bhagavatamrta. The title begins with a disscusion of the intrinsic nature of Krishna. The second part deals entirely with the theme of the devotee of Krishna. This title of Visvanatha Cakravarti is an in-depth analysis of the various stages on the path of bhakti from the very beginning until the perfection. It is based on the famous "adau sraddhah" - verse of Rupa Gosvami's Bhakti-rasamrita-sindhu. Prameya-ratnavali, compiled along with Govinda-bhasya, is Baladeva Vidyabhusana's further contribution in establishing the scriptural basis of the Gaudiya school. Baladeva draws much of what he writes in this work from the teachings of Acarya Madhva. Composed in simple Bengali verse, Narottama Das Thakur's Prema-bhakti-candrika is a beautiful work delineating the basic truths of the theology and practice of bhakti. Drawing much of its contents from Bhakti-rasamrita-sindhu, Visvanatha Cakravarti compiled the Raga-vartma-candrika as a treatise clarifying the orthodox practice and precepts of the raganuga bhakti tradition. 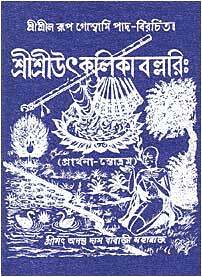 This voluminous work was compiled by Jiva Gosvami on the basis of Gopala Bhatta Gosvami's notes. Sat-sandarbha consists of six sandarbhas, namely Tattva-sandarbha (Treatise on Truth), Bhagavata-sandarbha (Treatise on God), Paramatma-sandarbha (Treatise on the Supreme Soul), Krishna-sandarbha (Treatise on Krishna), Bhakti-sandarbha (Treatise on Devotion) and Priti-sandarbha (Treatise on Love). These six treatises systematically present the teachings of Sri Caitanya along with scriptural evidence. This work of Rupa Gosvami's exclusively discusses the conception of madhurya bhakti rasa (amorous devotional love), a theme which the author chose not to elaborate on in his Bhakti-rasamrita-sindhu. Upadesamrita belongs to Rupa Gosvami's Stava-mala, but is often seen as a separate publication, since it contains eleven essential instructions to be followed by both aspirants and practitioners of the path of bhakti. Going under a number of names and in various renditions, works commonly known as Gutika are manuals delineating the detailed practice of remembering the eight-fold daily pastimes of Radha and Krishna, compiled on the basis of the teachings of Siddha Krishna Das Babaji of Govardhana. Both Gopala Guru Gosvami and his disciple Dhyanacandra Gosvami have compiled a manual carrying the same title. They are the first among the manuals used by Gaudiya Vaishnavas in their practices of esoteric worship. This elaborate title, a joint work of Gopala Bhatta Gosvami and Sanatana Gosvami, was compiled on the request of Sri Caitanya to establish the rituals and rules of conduct for the Gaudiya Vaishnava tradition. Over its twenty chapters, it focuses on diverse themes of primarily ritual worship and requirements thereof.